Palm oil is extracted from the tree called African oil palm. The plant was first mentioned in Equatorial and North Africa a few thousand years ago. Now, the African oil palm is also cultivated in Southeast Asia and South America. The production of palm oil constitutes more or less 80% of world production (such rate is reached in Indonesia). Why is the product so popular? Palm oil is designed for skin and hair care. Its amazing performance is dependent on a few factors. The ingredients of the product are very important. Vitamins A and E, coenzyme Q10, saturated and unsaturated fatty acids and beta caroten are among the ingredients which take care of proper condition of our organism. Natural and original palm oil should be cold-pressed and cannot be refined. Why? Only then will it keep its precious active ingredients. That is why, while shopping check place of origin and method of extraction. Storage is equally important. If you want your palm oil to keep its properties longer, you must store it away from the light, moisture but in the original and tightly closed container. What influence does the oil have on skin and hair? Its basic property is intensive moisturizing. The cosmetic provides skin cells with proper hydration, speeds up regeneration and restoration of natural lipid coat of skin and hair, helps to eliminate dry cuticles, alleviates irritation caused by scrapes or damage of the epidermis. Palm oil is equally great at moisturizing dry hair. It rebuilds split ends, helps to fight dry scalp and dry dandruff. Also, it smooths, softens and gives shine to even most damaged strands. Palm oil is designed for brittle and damaged by various styling treatments hair. It isn’t recommended for oily scalp or in case of improper functioning of sebaceous glands – applying a moisturizing product to hair could cause even higher sebum secretion. Palm oil can be applied in a few ways. It’s important to do a skin allergy test before first application – apply a small amount of product to skin behind the ear. If no irritation occurs after 24 hours, feel free to use the oil. The cosmetic is a solid therefore you must heat it up before applying to hair or scalp. The product will become more plastic and the application – much easier and pleasurable. 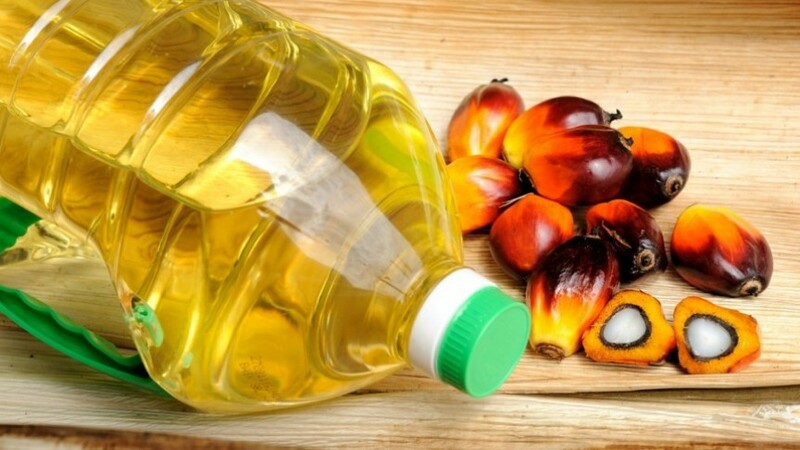 Palm oil can be applied to dry or damp hair. You apply it to ends or whole strands. After more or less one hour, wash the cosmetic away and apply a small amount of silk spray to your hair.